Dear readers, Thank you for your loyalty and support me during this time. I can stand as it is now if there is no you, you, and you all. Enough enough, I'm even more talking like a speech, okay, relax. Honestly I'm very happy that my blog finally stepped its first year, yeah, time flies. Now, I'm going to announce my Blogversarry Giveaway winner, and there are 3 Lucky winners here! 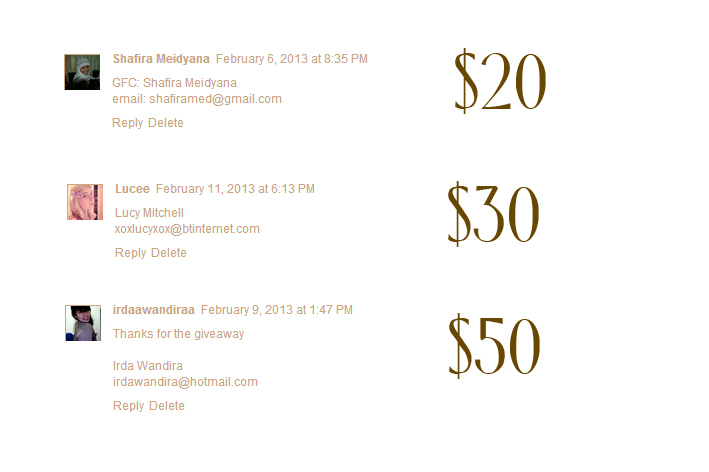 So, the 3rd winner will get $20 shopping voucher from Edressy, $30 for 2nd winner, and $50 for the 1st winner. too bad aku gak menang.. tapi gak papa, thank you udh visit dan follow blog aku. Her name is Marcella hahahaha. okay I'll ask her tomorrow in class about Julliani. Thank you for the sweet comment! It really touched my heart and encourage me to be a better blogger! thank you Wulan!